The Pipe command creates a surface with a circular profile around curves. Pick the start radius at the beginning of the pipe. If the curve is closed, pick the radius for the pipe. Pick the radius at the end of the pipe. Pick a point for the next radius, or press Enter to end the command. Selects surface edges that are touching the selected edge. Allows selecting more than one curve. Toggle between picking a Radius and picking a Diameter. Determines whether the pipe has two walls or one. Pick the first start radius. Pick the second start radius. Pick the first end radius. Pick the second end radius. Specifies how to cap the ends. If the curve is a polycurve of lines and arcs, the curve is fit and a single surface is created; otherwise the result is a polysurface with joined surfaces created from the polycurve segments. FitRail=Yes (left) and FitRail=No (right). The pipe radius stays constant at the ends and changes more rapidly in the middle. 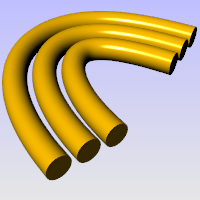 The radius is linearly blended from one end to the other, creating pipes that taper from one radius to the other. Specifies the value for the distance between the inside and outside of the pipe. Negative numbers make the first radius the outer core.